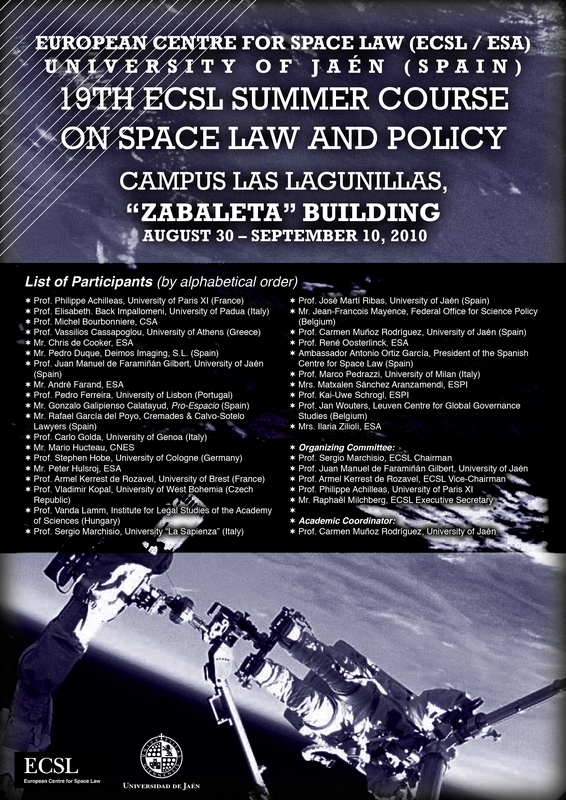 One of ECSL’s most successful activities is the ECSL Summer Course on Space Law and Policy, which is open to students of all levels of study, as well as a few young professionals already working in the space or space-related sectors. The course is now in its 27th year and boasts a large family of alumni around the world. The course is organised each summer by the ECSL with the support of a host university or other institution. The 2018 Summer Course will be organised together with the Finnish Ministry of Economic Affairs and Employment, and take place in Helsinki, Finland from 27th of August to the 07th of September. During the course participants have the opportunity to meet highly qualified experts, to learn from their experience and to visit the premises of companies operating in the space industry or intergovernmental bodies. We are planning an ambitious course program, with visits to many Finnish institutions and organisations who work with or do research in space. The course will this year also cross the Baltic sea, where one day will take place in beautiful Tallinn, Estonia. More information about the program will be made available in the coming months. The theme of this year’s course will be the Arctic and New Space, aiming to both highlight the particular relevance of space technologies to this vast region as well as the opportunities and challenges that are arising in a new space economy. The course will also feature a project, where all participants must take part. Each group will present their project on the final day to a panel of judges, who will award one group as the winner. For students who are citizens of or studying in an Member State or Associated State of the European Space Agency (ESA) there is no course fee, and the accommodation will be organised and paid for by the ECSL. For students who are not citizens of or study in any ESA Member State, the course fee is 1200 Euros, this includes accommodation that will be organised by the ECSL. Students from ESA Member States and Associated States are given priority, but every year we accept a few students from non-ESA states. For Young Professionals the course fee is 1200 Euros, this includes accommodation that will be organised by the ECSL. This is primarily a Course for students, but each year we do also accept a few Young professionals. Both students and Young professionals are expected to organise and pay for their own transport to Helsinki, and have a travel insurance for the duration of the course. The insurance should cover travel/third party liability. Participants are also expected to cover some local transportation costs in Helsinki as well as living costs, although some transportation and meals may also be covered by the ECSL or local partners. Participants are expected to arrive in Helsinki on the 26th of August, and stay until the 8th of September. We will only accept participants who can stay the whole time, and participants are expected to take part in evening and weekend activities. For more information check out the information in the right hand tool bar. Please fill out the Application Form in the right hand tool bar, and submit the Application form and a CV to your NPoC or ECSL Secretariat in line with the instructions above. The ECSL will also recruit four Tutors for the Summer Course. As a tutor you get a chance to interact and engage with other young space enthusiast, as well as some of the most prominent people in the field. You will get organisational and tutoring experience, a chance to learn from all the lectures while potentially experiencing a new country. Tutors are usually selected from previous years' Summer Course students, as they are familiar with the structure of an ECSL Summer Course and have experience of preparing and presenting a group project. Tutors receive a place on the course and accommodation free of charge but they are still required to pay for their transport and insurance. The main task of the tutors is to tutor the teams for the project and assist the Executive Secretary with the day-to day running of the course. More information and application instructions is available in the Tutor Information 2018 document in the right hand tool bar. If you are interested in applying as a tutor to the 2018 Summer Course, send your CV and Motivational Letter to the Executive Secretary on ecsl@esa.int by 24:00 (CET) on Thursday 21st of June 2018. All applications should be in line with the instructions of the Tutor Information 2018 document. The organisational team responsible for the 2017 ECSL Summer Course. Consisting of the the local team from Sapienza University, ECSL Executive Secretary and four ECSL Tutors.